Tightly-packed columns of deliciously scented white, bell-shaped flowers. Height 25cm. Bulb size 16/17cm. 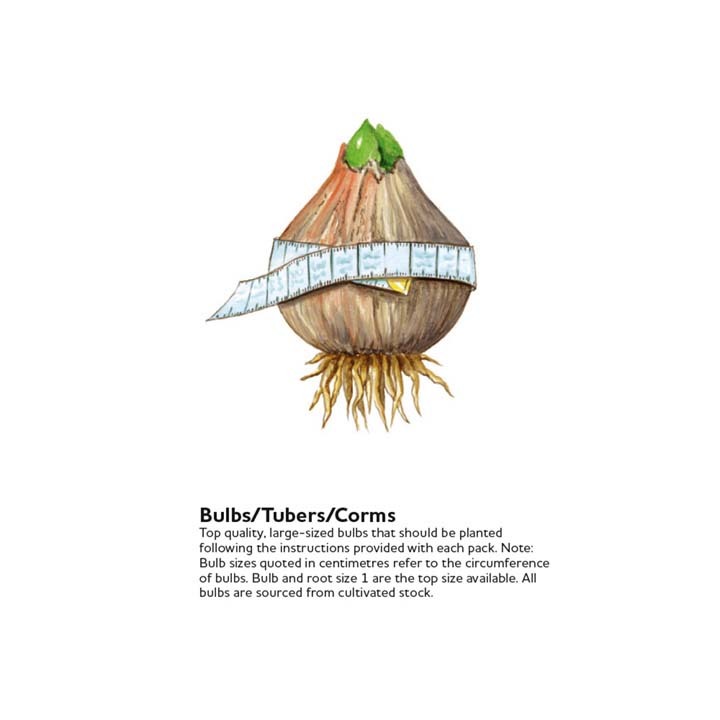 (Bulb sizes quoted in centimetres refer to the circumference of bulbs. All bulbs are sourced from cultivated stocks.) Please note: Handling bulbs may cause temporary itching. Don’t forget that bulbs aren’t just for outdoors. This selection of varieties have been specially prepared to put on an outstanding show in your home. Simply plant them up in some of your favourite planters and in a matter of weeks, when they come into bud, be ready to move them into pride of place! 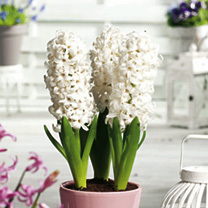 Plant your bulbs by early October, keep them in a cool room for about 8 weeks (hyacinths should be kept in a cool, dark place until the flower buds show), then bring into a warm, light room for flowering. Planting bulbs in groups will produce a colourful spring display. For best results plant your delivery of bulbs as soon as possible, although tulips can benefit from planting in November as this will help to avoid frost damage to early shoot tips in spring. When planting choose an area that is freely drained as bulbs will rot in waterlogged areas. As a general rule for outdoor planting, you should bury the bulb to a depth three times the height of the bulb. Small bulbs can be planted 10-15 cm (4-6") apart and larger bulbs such as daffodils and tulips plant 15-20cm (6-8") apart. If planting in containers, bulbs can be planted closer together but ensure they are not touching each other. Containers that will bloom for months! By planting layers of different bulb varieties your containers could be blooming from February to May! Cover the pot's hole with at least 5cm of small stones or crocks to improve drainage, and use a 50/50 mix of good quality compost and garden soil. Allow just 1cm gap between bulbs and don't allow them to touch the sides of the pot. Provide protection over winter, and move outside when the first green shoots appear in spring. Ideal for pots and containers. Scented.